The team has been working on a new film “Our Friends Electric” which investigates voice technologies and AI assistants for the Mozilla Open IoT Studio. The film explores our developing relationship with voice activated AI assistants, and the future potential of these relationships through three fictional devices. The film premiered at the V&A Digital Design Weekend at the end of September and can now be seen online. We’ve have developed a new design for air pollution sensing kit, Buggy Air, to cater to a greater variety of users. 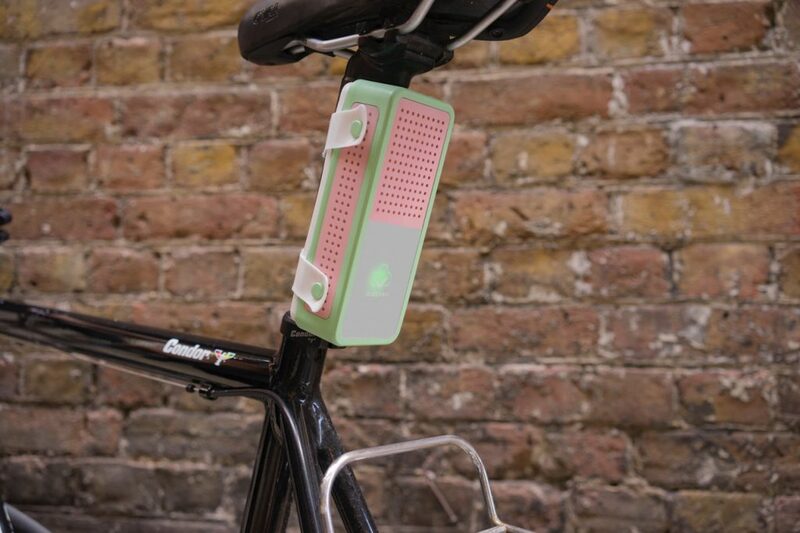 It can now be mounted on bikes, rucksacks and buggies with a view to expanding the use of the device across London. A few weeks ago we presented the new device at the Design Frontiers exhibition at Somerset House for the London Design Festival. The device formed part of a collaborative installation with Strange Telemetry and Wesley Goatley called Moving Mephitic Air. To find out more, here’s an interview with Buggy Air’s designer Jon Flint. We have also been working to develop the 2030 Government Strategy for the State Chancellory of Moldova and UN Agency, and ran a workshop in Chișinău with government officials across department at the end of August. We hope to share more about this ongoing project soon. Another new film from the studio: Mangala For All has been released into the world. The film was first shown at The Phoenix Gallery in Leicester and will be available online shortly, in the meantime here is the trailer. Last week we hosted the first in a series of new events at Somerset House called The Future(s) of Power investigating the locations of power in society, and methods for resistance and agency. 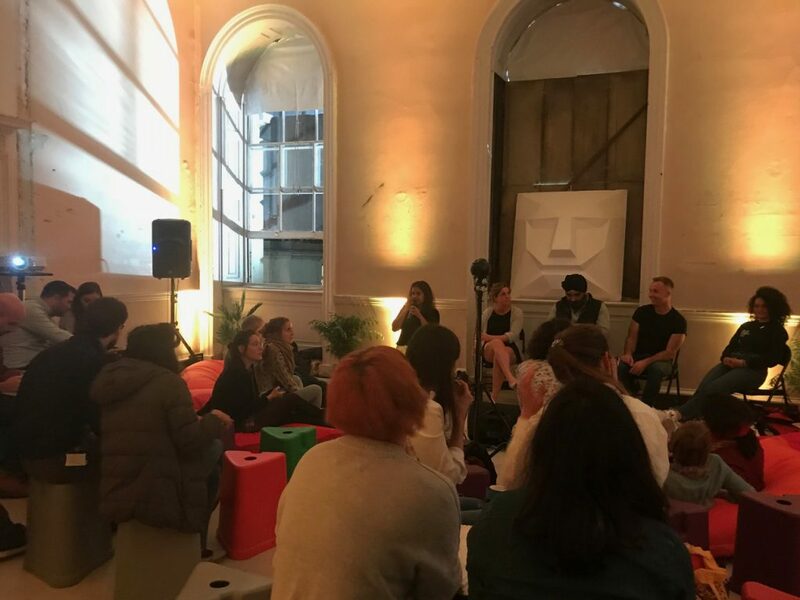 We were really lucky to be joined by a great range of speakers: Aviah Day (Sisters Uncut), Dr Catherine Haddon (Institute for Government), Indy Johar (Project 00, Dark Matter Labs) and Jacques Peretti (Journalist and BBC Filmmaker). In the near future we’ll be announcing the line up for our next event on December 6th. We are looking forward to setting up our project ‘Mitigation of Shock’ exploring the implications of climate change and food insecurity in 2050 for the After The End of the World exhibition at the CCCB in Barcelona, which opens to the public from the 25th October. We have been featured in an article in the Financial Times about Somerset House Studios and all the great work that’s being done by our fellow residents and the studios team. Anab was interviewed for NPR’S TED Radio Hour, for their episode ‘Future Consequences’, where she explains more about our process and philosophy. Recently we put out a call for collaborators, and we are overwhelmed by the response. Thanks to all those who wrote to us, we will be in touch regarding future possibilities. Also, if you are a London-based futures researcher and writer, we would love to hear from you for an upcoming opportunity. And finally, we’re very lucky to welcome Nicola Ferraro to Superflux as our new studio manager, and happy to announce that applications for winter internships are welcome. We are specifically looking for folks interested in working on films, futures, writing and research. If you are interested, drop us a line with your portfolio. That’s all from us for now, watch this space!